Orphans of the Storm is a 1921 silent drama film by D. W. Griffith set in late-18th-century France, before and during the French Revolution. 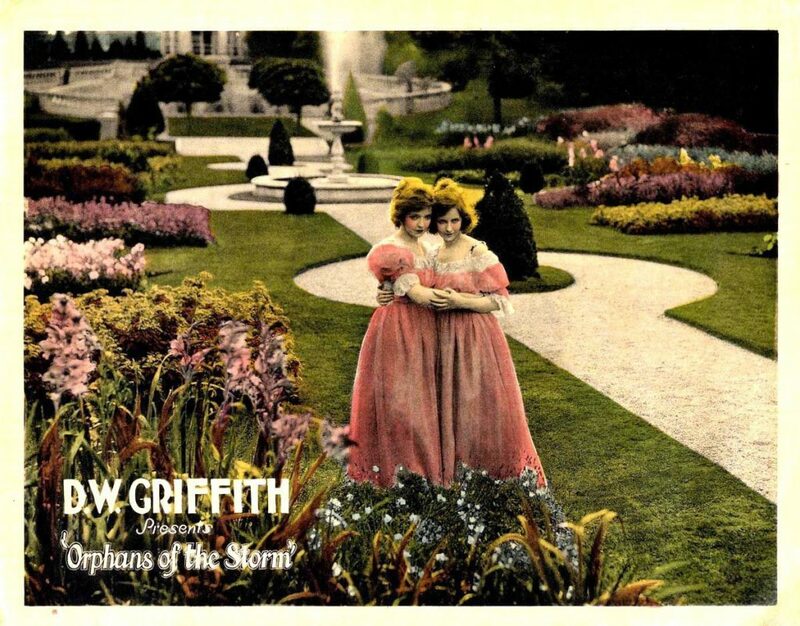 The last Griffith film to feature Lillian and Dorothy Gish, it is often considered Griffith’s last major commercial success, after box-office hits such as The Birth of a Nation, Intolerance, and Broken Blossoms. The film is based on the 1874 French play Les Deux Orphelines by Adolphe d’Ennery and Eugène Cormon, which had been adapted for the American stage by N. Hart Jackson and Albert Marshman Palmer as The Two Orphans, premiering at Marshman Palmer’s Union Square Theatre (58 E. 14th St.) in New York City in December 1874 with Kate Claxton as Louise. It had been filmed in the United States twice before Griffith did his film: in 1911 by Otis Turner and in 1915 by Herbert Brenon (the lost Theda Bara film The Two Orphans). The play had also been filmed twice in France in 1910: by Albert Capellani and by Georges Monca. The movie uses several visual effects throughout to capture the emotion of its story, using monochromic filters of red, blue, green, yellow and sepia to show feeling with the silent action which is accompanied by music; the movie also uses fade-ins to achieve this effect, expressing the distinct class divide and captivating the attention of viewers for a two-and-a-half-hour film. The Two Orphans, the English-language version of the French play upon which the movie is based, had been filmed at least twice by 1920, and had been a staple of the actress Kate Claxton. After the premiere at the original Union Square Theatre in 1874, she had performed it hundreds of times for various theatrical companies in New York, including the Brooklyn Theater (she was performing it there on the night of the infamous Brooklyn Theater Fire in 1876), and she had eventually acquired the US rights to the play. In securing the film rights, Griffith had to wrangle with Miss Claxton, who for unknown reasons seems to have been reluctant to allow the story to be filmed a third time. When Griffith completed his film for release, a rival German version of the story had been made (Claxton owned foreign film rights as well) and was being prepared for release in the US at the same time as Griffith’s version. Griffith bought out the US distribution rights to the German version so that it could not conflict with the earning potential of his own film. The New York Times wrote: “As the vivid scenes of the historically colored melodrama flashed one after another on the screen everyone surely felt that Griffith was himself again” but added “The seasoned spectator, no matter how he may let himself go, knows that every delay is a device to heighten the suspense and every advantage given the rescuers is calculated to evoke his cheers (…) whatever he does, he is not surprised when the girl is saved”.